some comments by some readers. Both, Still in Control, Gene, and Theatre Impressario and Science Nerd, Scott, commented how the yellow riding mower should be considered for modification as a mobile telescope transport machine. Yes, I can see it now! The mower can be used to create its own path to the observing site, support the telescope and mount and minimize setup time and remove any other amateurs that get in the way! Ok, maybe there is something to that idea! OCA Retired Semiconductor Physicist, John, commented that everyone knows about the large mosquitos and chiggers and they don't get bit, but that is one of the reasons why he, as soon as he could, moved away to southern California. That's for the comments! One article in the latest Science magazine that caught my eye while lounging in air conditioned comfort, was an article, "Space ripples may untangle black hole tango", by Adrian Cho. The article discussed how the formation of a single black hole is consistent with the current understanding of stellar collapse and formation of a black hole, but the real mystery is how black holes are formed in pairs. The graphic below shows the leading scenario for pair formation. 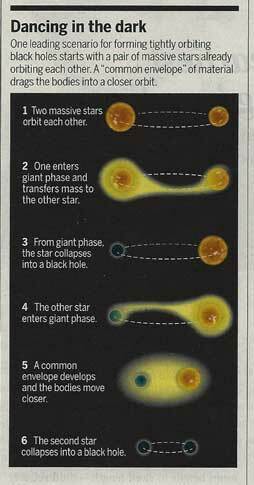 Another model of pair formation, is that even though black holes forming separating and then just by random motion find themselves close enough together to form a pair, is possible, it does not seem likely. This approach is disfavored because these black holes would more likely just whiz past each other, even though they are gravitationally attracted, because they would typically have way too much angular momentum to actually collide. The article goes on to discuss the effect of spin of each hole and other details which you can check out if interested. So we will see how well this leading scenario fares when more data from LIGO, showing a larger sample size of merging black holes, becomes available. As discussed in a previous post, I have signed up for an astronomy conference in Baton Rouge, which includes a tour of the LIGO observatory, a tour which I really look forward to. At the same time, I was wondering why it is that they welcome all of us traipsing through the observatory, when all of our little feet will generate all sorts of acoustic noise that could interfere with the observations. Well, the article went on to say that the LIGO runs will be shut down in August in order to make improvements to increase the detection sensitivity so having all of us there in October will not interfere with any scientific observing program. Good; I would not want any clumsiness on my part to interfere and cause the observatory to miss the 4th observed black hole merger. Anyway, while cooling off indoors, I started fabricating an easy slip on, slip off adapter for the solar filter for my 300mm telephoto lens. I mentioned the need for this easy filter removal tool because during the actual eclipse there is not enough time to fumble around with the fine threads on these filters. 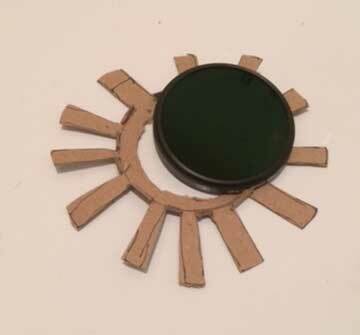 There are many ways of accomplishing this, but I just choose to build by own adapter out of some stiff cardboard. See below, which shows the first piece used to secure the filter. Ok, this next photo shows the final easy slip on, slip off solar filter adapter for the DSLR 300mm telephoto lens. I didn't want to have to deal with unscrewing the fine threads on the solar filter, and possibly bumping the camera setup, at the time of totality during the August 2017 eclipse. I am a bit concerned that trying to get by without a tracking mount might be a big mistake. Without a tracking mount, I'll have to manually track the sun and during totality the sun will be hard to see (yes, that is what totality means) and if something gets bumped, I'll have a hard time getting set up again. Anyway, I'm still going with my decision not to pack up and fly with a tracking mount to Wyoming. I'm already breaking one of the rules of veteran eclipse viewers who say that you probably should not try to take photos during your first time experiencing a total eclipse. So we will see! I hope I can achieve some sort of tradeoff between just experiencing the eclipse while getting at least just one photo during totality. I realized that the homebuilt slip on adapter really should be tested to ensure that no stray light was getting around the filter, which could be very damaging to the camera. So, even though it was very hot outside, I took the whole setup outside for just a 5 minute observation test using the sun. No extraneous light was bypassing the solar filter and even though the sun was obscured by clouds I elected to take at least one photo. Oh, oh, this is when I got my first lesson, about how easy this was going to be, because I discovered that I could not make any focus adjustments because the cardboard sleeve covered up the focus knurled ring and I have to just make a guess at the right focus by first of all removing the filter and focusing on some remote trees in the distance and then putting the filter back on and pointing toward the sun. The photo below shows what I finally captured. Yep, it is way too cloudy and no sun spot activity was going to be observed, which is actually consistent with the very quiet period on the sun. So, I learned that I wouldn't be able to focus on the sun unless some design changes were put in place. 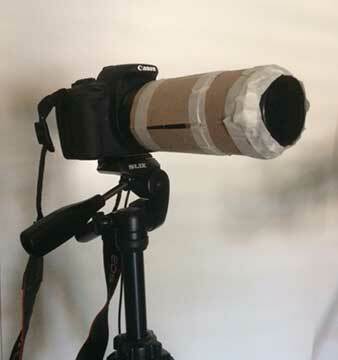 Well, this was easy to do and I just cut some slits in the cardboard tube so that my fingers could twist and adjust the focus ring. Problem solved, but it definitely showed the need to practice what you intend to do when you do the actual eclipse observing. There won't be enough time to find out that your setup is not going to work during the eclipse itself. By the way, I should also mention the first lesson that happened during the fabrication of the filter adapter. Originally, the length of the tube was several inches shorter and when I tried to adjust the focal length, the tube was not long enough to be still securely in place, so I had to begin again with a slightly longer tube. Oh well, it just takes a pair of scissors and a little glue. Lesson learned and solved. I was also curious about how much attenuation the solar filter provided so that it was safe to view the sun through the filter. So, I resolved to get back inside for now. Later in the evening, while taking Astronomer Assistant's Ruby and Danny, out for a walk around the observatory grounds, the nearly full moon provided a good target to try to measure how much the solar filter attenuates the solar energy. Check out the AIP4WIN screenshot below for the first test image of the moon without the solar filter in place. This image was taken with 1/1000 second exposure and the average pixel brightness along the yellow profile line was about 1052 ADU. This measurement should not be considered as an actual photometric estimate because none of the usual calibration using flats and dark images and effects of lens vignetting had been done. AIP4WIN uses the green pixels in the DSLR, which offers a pretty good approximation to the color filters used by professional photometers, so at least that calibration was in effect. Now, it is time to slid the solar filter in place and take another image. The focal length and focus were not changed for this image. 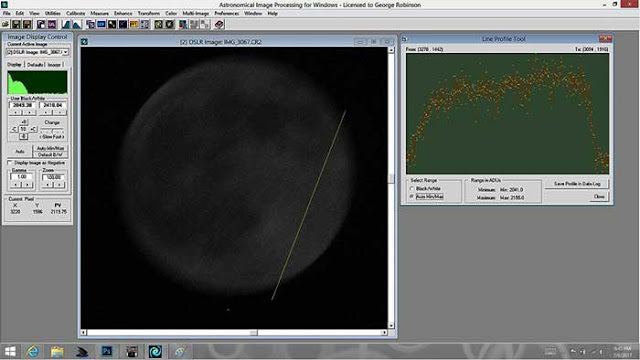 Check out the screenshot below which shows how 10 seconds of exposure time were needed to get a bare view of the moon. 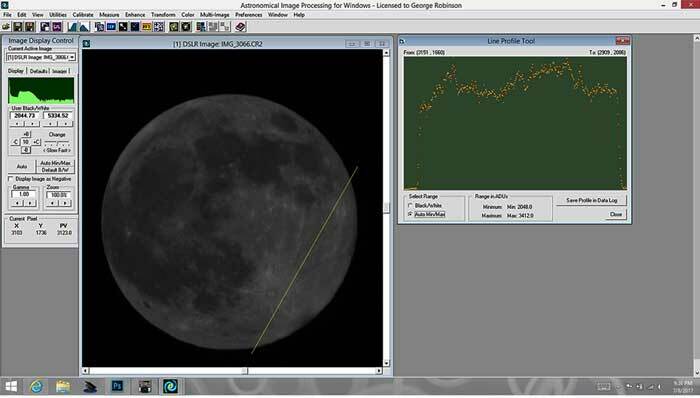 So we can use these two images of the moon to estimate the attenuation of the solar filter. First, the exposure times differ by a factor of 10,000 between the baseline moon photo and the photo of the moon through the solar filter. Secondly, the first image is brighter than the second image and we have measured average pixel intensity along the profile line to be 1052 ADU for the first image and only 80 ADU for the second image with the solar filter. Combining the effects of less light and longer exposure time results in an effective measurement of attenuation as 10 + 2.8 = 12.8 magnitude. This magnitude attenuation corresponds to letting only about 1/130,000 of the photons though. I have no information about the spectral response of the solar filter, but this single measurement provides at least a first estimate of how much light is removed by the filter. This magnitude attenuation is just about the same as the difference in the visual magnitude of the sun (-26.7) and the moon (-12.8), so the filter would make the sun's image appear about the same brightness as the moon. Maybe when the daytime and nighttime clouds go away we can all get out and do some more observing. I still look forward to trying the new tripod on wheels tool. No, I'm not going to consider any further use of the proposed riding lawn mower!